Virtua Tennis 2 (known as Tennis 2K2 in the United States and Power Smash 2 in Japan) is a sequel to Virtua Tennis that was released for the Dreamcast, Sega NAOMI arcade unit and Sony's PlayStation 2 (known as Sega Sports Tennis and Virtua Tennis 2 in Europe) in 2001 . 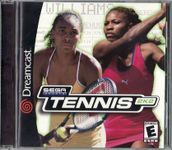 New features included the ability to slice and play as female players (such as Monica Seles, Venus Williams, Serena Williams and Lindsay Davenport) and mixed doubles matches. The game was created and produced by Hitmaker, with Acclaim Entertainment publishing it in Europe for the PS2. The PS2 version is compatible with the multitap, allowing for four players on one console at the same time. Source: Wikipedia, "Virtua Tennis 2", available under the CC-BY-SA License.